Situated at the northeast junction of a rural crossroads between the Roanoke River towns of Hamilton and Williamston, Spring Green Primitive Baptist Church’s pastoral setting has changed little from when this front-gable, frame meeting house was constructed over a century ago. Although the pine and oak trees cited in its December, 1878 deed no longer stand, the church and cemetery, which occupy a triangular-shaped, three-and-a-half acre tract spilling over on either side of Spring Green Road (SR 1409) and NC Highway 903, and are shaded by pines, an oak, and small flowering trees. The area immediately around the church is bare. The church and cemetery are surrounded by cultivated fields and small patches of pine woods, much as they were throughout the nineteenth and early twentieth century. 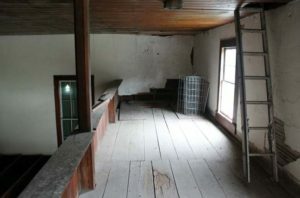 Due to an 1884 Martin County Courthouse fire, the actual first of three deeds for the Spring Green property cannot be found and the part of the second deed that contains the actual description of the land is missing. The deeds were issued in 1811, 1851 and 1878. The first building was log construction with a dirt floor, one door and one window behind the pulpit. The log structure was abandoned in 1851 when J.B. Griffin deeded the church a parcel of land and a second building was built. The second building burned in 1861 and the early church records are assumed to have been burned also. In 1878, the land for the third building was deeded to the church by S.W. Outerbridge and R.D. Matthews. It is thought that the present church was constructed across the road from the one that burned. According to the Official Records of the War and Rebellion, Spring Green Church was occupied by Federal forces moving through the area in the Civil War. 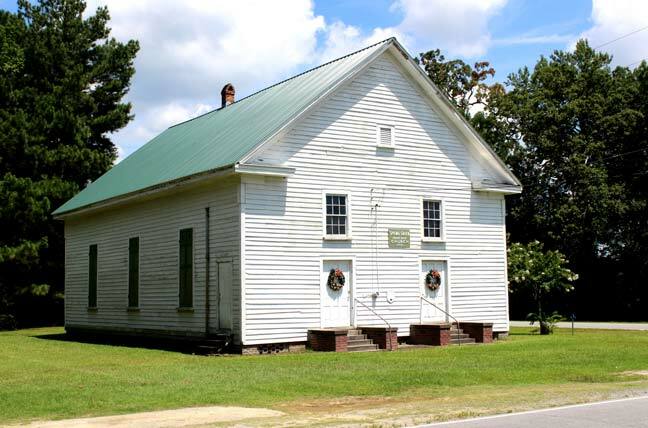 The overall appearance of Spring Green Primitive Baptist Church is that of a large gabled box. There is its late Greek Revival style discerned by the building’s massing, the proportion of doors and windows, and small exterior details such as molded corner pilasters and handsome pidimented gable ends, each gable pierced by a small louvered ventilator. Dimensions of the 1879 weather-boarded church are thirty-six feet, four inches wide at its gable ends, and fifty-five feet, four-and-a-half inches long at its side elevations. The building rests on low handmade brick piers with a twentieth-century latticework brick infill. Three elongated six-over-six, double-hung sash windows pierce the church’s north and south walls, with two identical windows at the east gable end.